I found this really interesting line from Windham Fabrics called “Measure”. They have fabrics that show compasses and rulers and writing and I just loved it. I had been looking for a color palette of browns, creams and maybe a touch of black. This fabric line was perfect for the 16-patch quilt I had in mind. 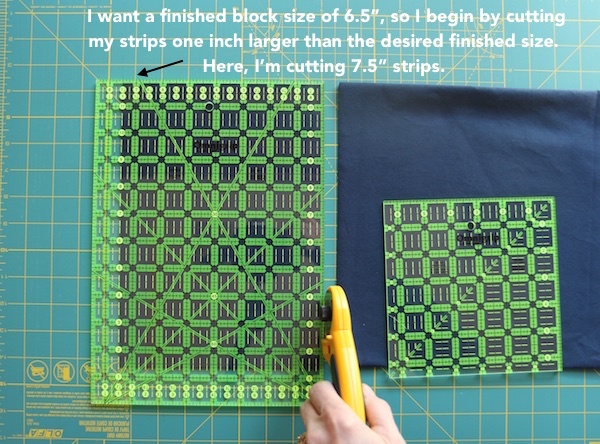 I’m also going to show you how I made the 16-patch blocks and give you my measurements for cutting. I added some Kona solids and another text print called “Bee Creative” by Deb Strain for Moda. For the background, I used Kona Ivory. The finished quilt size is 48″ x 60″, which I consider an ideal size for a throw quilt to curl up with on the sofa. This quilt was composed of twenty 16-patch blocks. The squares in the finished quilt are 3″. The 16-patch blocks in the finished quilt are 12″. I prewash all my fabrics – if there are any surprises, I want them now and not when I wash the finished quilt. 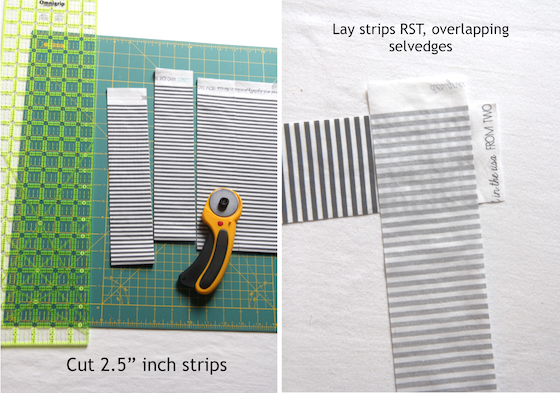 I cut (40) 3.5″ WOF strips total, 20 in the various prints and 20 in the background fabric. You need 2 yards of the background fabric and 2 yards of various prints. Repeat with your other prints, varying which fabrics you have in the top and third positions, so you have a great variety. Then lay these out into 16-patch blocks, starting with a dark fabric in the top left position. Sew together into blocks. The seams should all nest. Repeat until you have 20 16-patch blocks and then just lay all the blocks in a pleasing array – four blocks across, five blocks down, and sew together. I used a fabric for the backing called “Henry Glass Principle Circle Play in Cream“. It is a 108″ wide quiltback which is terrific – no piecing of the back! There seems to be more 108″ wideback fabrics available now than there used to be. I used my new favorite quilt batting, Quilter’s Dream in the Supreme loft. I love this batting – it’s more expensive, but it makes a heftier, cozier and softer quilt than Warm and Natural. I quilted this using a 4.5″ stitch length and used Aurifil 40# cotton thread. For the binding, I did go with a classic stripe. Hawthorne Threads actually digitally prints lots of really interesting fabrics themselves and they do a whole line of stripes called “Dress Stripes” that are perfect for bindings – if you can’t find the color you want for stripes, check them out – they have almost any color you need. I used “Ochre” for this binding. I cut 2.5″ strips for the binding. 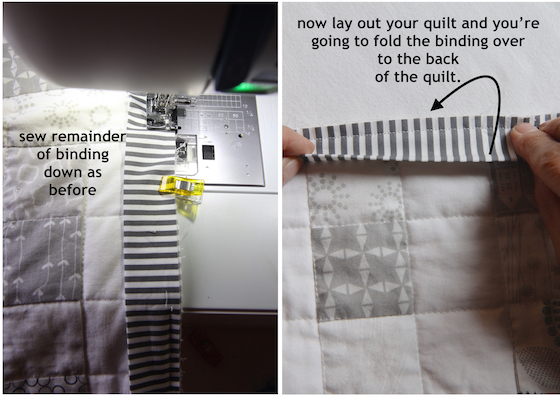 I have a tutorial on how to machine bind a quilt, if you need to know how to do that. 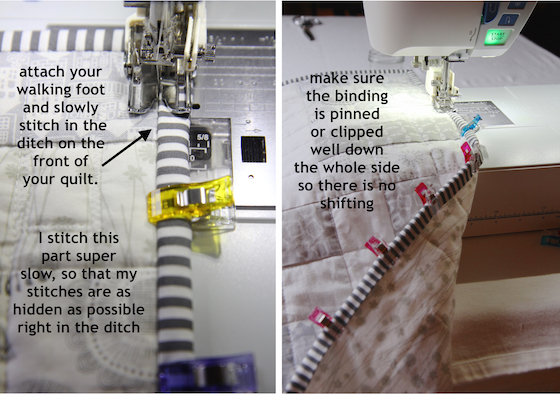 I do use a walking foot when I attach the binding. Can’t wait to send this off to its new owner! Thanks for stopping by. Hope you’re making something! This entry was posted in finished quilts, tutorial on February 10, 2018 by Beech Tree Lane Handmade. The only part of making a quilt that I do not enjoy is sewing the quilt back. I just hate calculating the dimensions, cutting the pieces and then sewing them together. 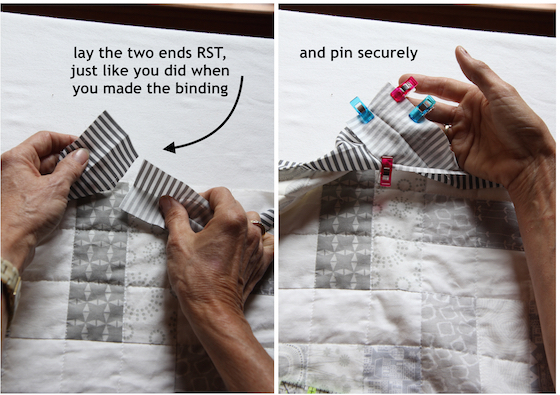 There are many, many ways to make a quilt back. You can even use 108″ wideback fabric, and not have to cut anything – but the fabric choices for those are limited. 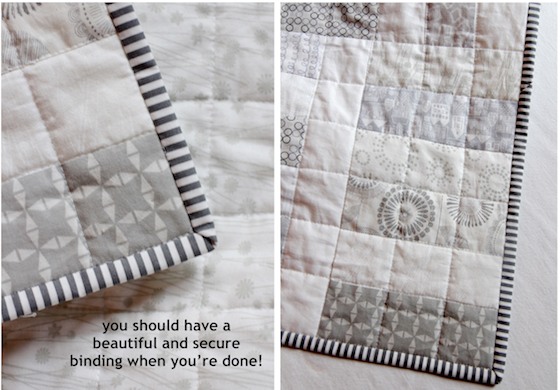 So, unless it’s a baby quilt, you almost always have to piece a quilt back. I can give you a method to make it a little easier. 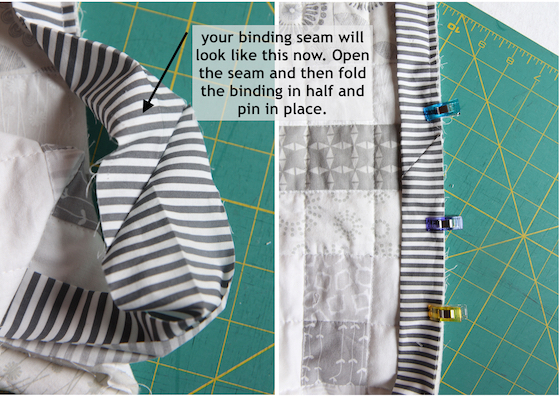 Instead of cutting two separate pieces of fabric and sewing them together, you cut one long piece, fold it together and then sew right down one side. You then cut off the little fold line and open the fabric up and you’ve got a quilt back. It’s very easy. 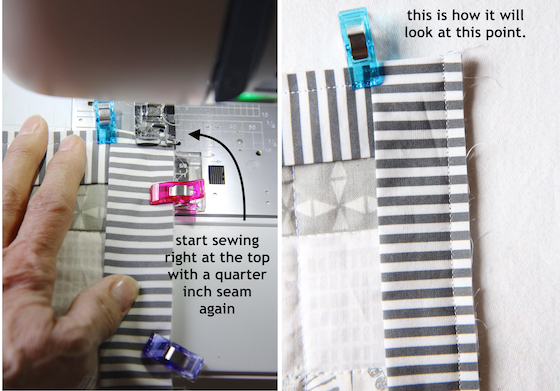 I get a lot of quilting questions from beginner quilters, so I am going to diagram this method out in a really basic way (I hope). 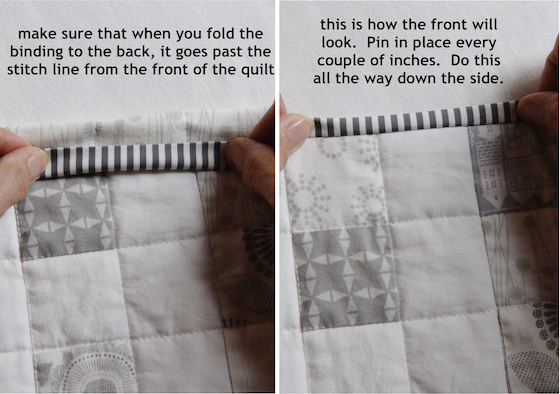 If you’re more of an advanced quilter, you won’t need such detailed instructions. 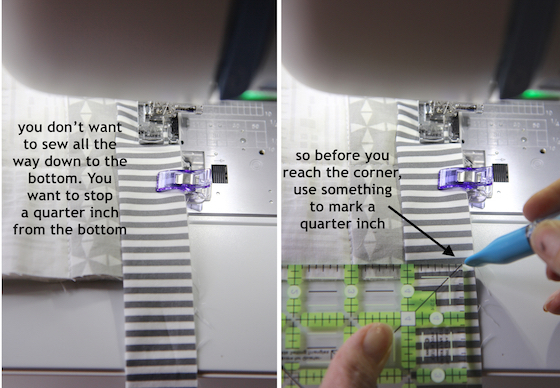 Keep in mind when you calculate dimensions for your quilt back, you have to take into account that although fabric width (WOF) is about 42 – 43″, you have to subtract the selvedges and you need to figure in ½” seams in your allowances. 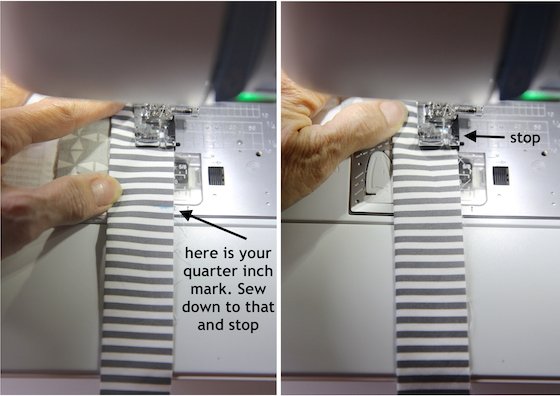 Also, if you want an overage on your quilt back, making it a bit larger than your quilt top, adjust accordingly – I always allow a couple inches all the way around the quilt for an overage. So remember to allow for those in your calculations. The example below doesn’t include overages – it’s just a example. Also, I’ve recommended this phone app before and I use it all the time – it calculates how much yardage you will need for your backing. It’s QuiltingCalc by Robert Kaufman. Very handy. 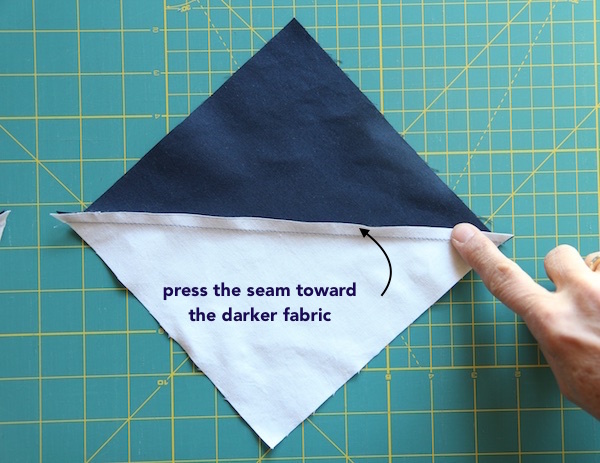 This method actually works well for certain directional fabrics, because folding the fabric over on itself lines up the pattern in the same direction. 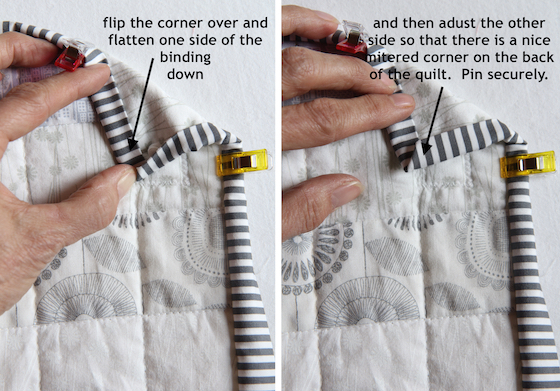 Also, this method only works on quilt tops which are under 80″ in length. Now just trim the length to the size you want. 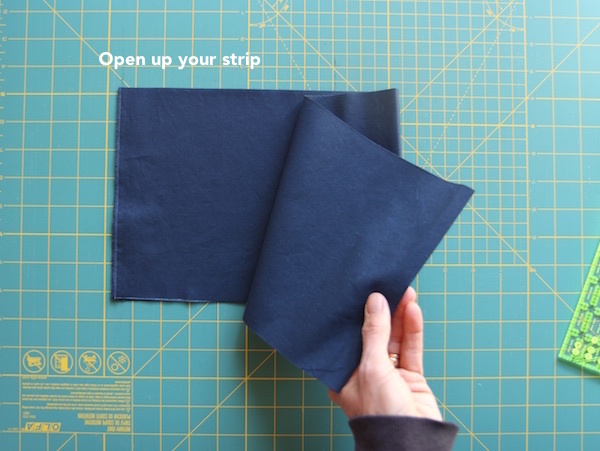 ● Cut the selvedges off before you press the seam open – they are tighter and have less give than the fabric itself and can cause a pucker sometimes. 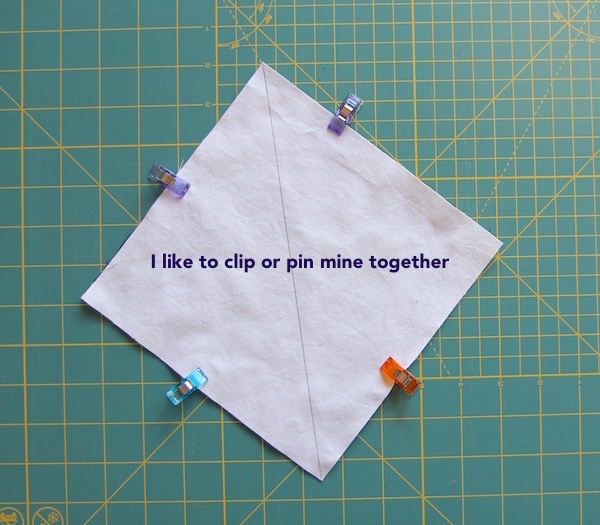 Make a big enough seam so that you can do this. 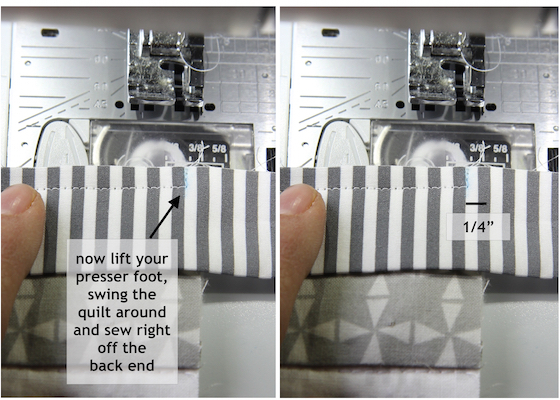 So make your sewing line ½” away from the selvedge. Press the seam open so it lays flat. 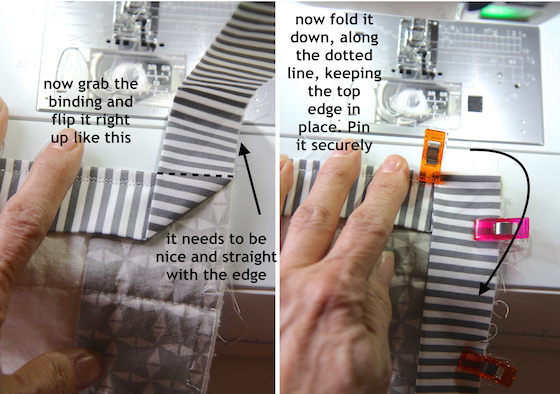 ● Use a walking foot if you can to sew the seam – it will move the fabric along better, so that it is even. I hope these instructions make sense and that they are helpful. 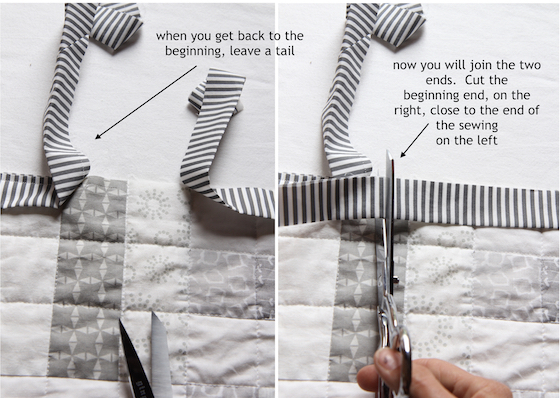 Do you have a favorite method of piecing a quilt back? This entry was posted in fabric, techniques, tutorial on March 23, 2017 by Beech Tree Lane Handmade. This is Method #3 in my tutorials on how to make Half Square Triangles. The first method makes 2 at a time, the second method makes 4 at a time and this method makes 8 at a time. 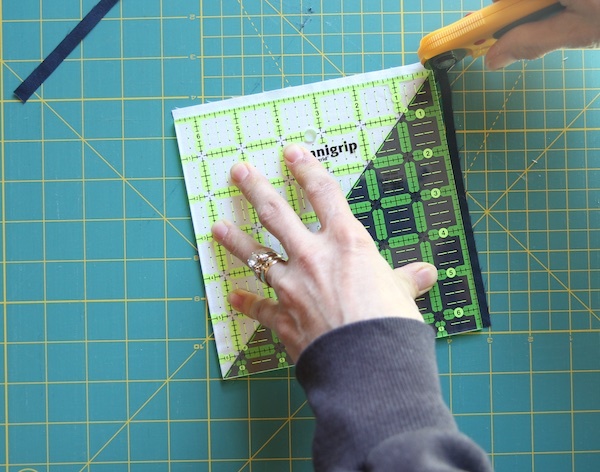 It is for sure the fastest way to make HSTs. 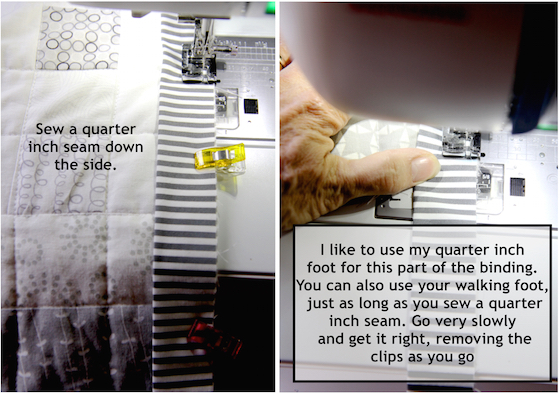 And it’s super easy – 2 squares of fabrics, sew 4 seams, make 4 cuts and trim. You can really crank them out with this method. And there are no bias edges on these blocks. You begin with cutting two squares of fabric the same size. I cut them generously because I like to trim my finished HST to size, so they are perfect. Here is a chart to give you the sizes. I have included a cutting size you can use if you don’t want to cut them oversize. This entry was posted in techniques, tutorial on January 26, 2017 by Beech Tree Lane Handmade. I used to avoid making Flying Geese blocks because of all the wasted corners of fabrics you have to cut off. I couldn’t bring myself to do that. But did you know you can make Flying Geese blocks with no wasted fabric? This was a game changer for me and now I love this block. I’m showing you how to make these blocks four at a time. I like to make these a little oversize, so I can trim them to perfect sizes. You cut one large square of fabric from the fabric you want for your Flying Geese (your main fabric). 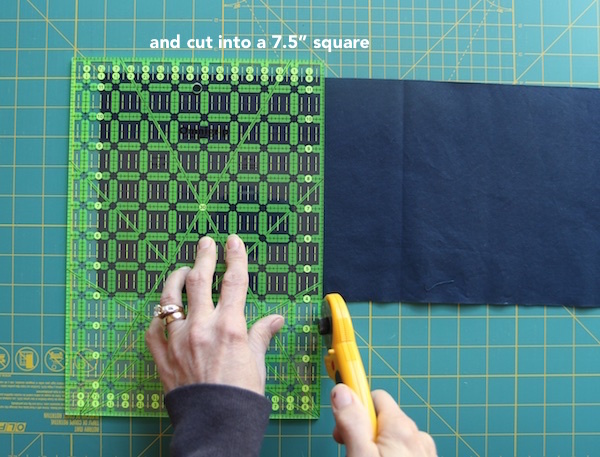 Then you cut four small squares from your background fabric. This chart shows you what to cut for various sizes. 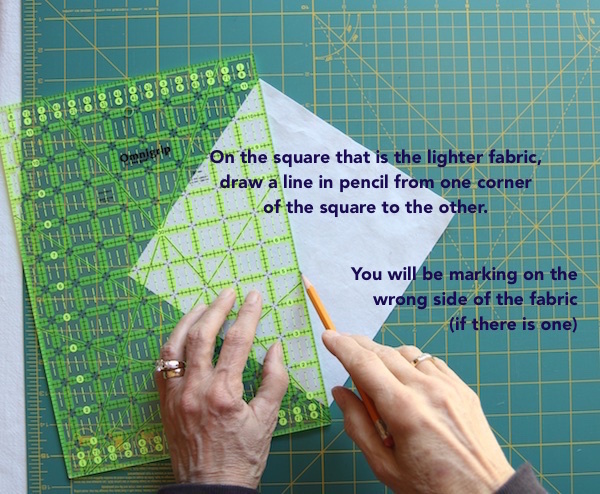 Remember – the finished Flying Geese Size in the chart is after being sewn into your project. After you trim them (before they are sewn in) they will be ½” larger than your desired finished size, so that you have ¼” seam allowance to work with. I hope this tutorial is helpful. Some Flying Geese tutorials are complicated and don’t seem to explain the technique very well – I hoped to make one that is very simple to follow. Happy Sewing! With this method, you will end up with four Flying Geese blocks. This entry was posted in techniques, tutorial on October 25, 2016 by Beech Tree Lane Handmade. I promised you way back when that I would post about how to make Half Square Triangles using a different method, making four at a time. 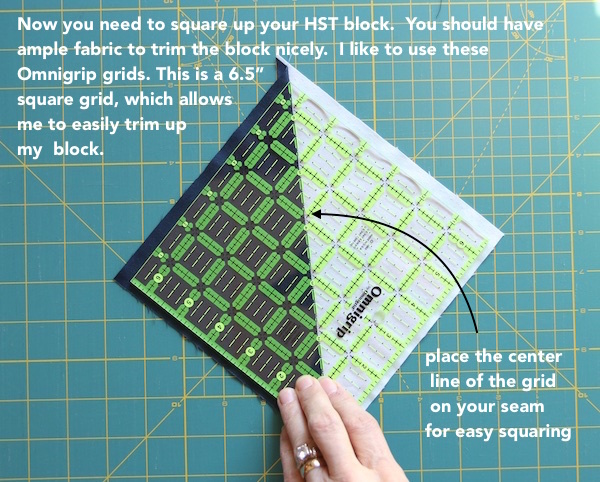 The HST continues to be the most fun block to design with, because of the endless combinations you can make with it. In my first tutorial, I showed you how to make one at a time. This second method, making four at a time, is super easy and very fast. The only drawback to this method is that you will end up with edges that are bias edges – which just means they can stretch a little bit. 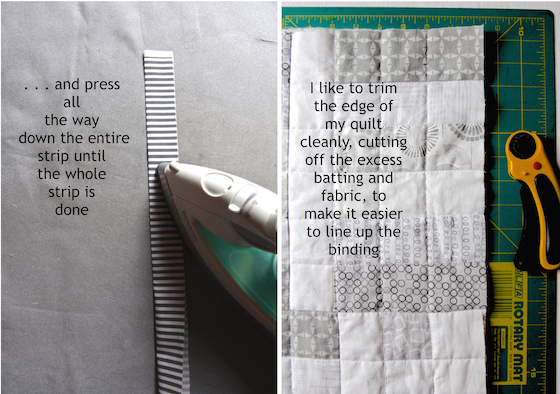 So, when pressing these blocks, be extra careful not to iron them and stretch them out – just press them. 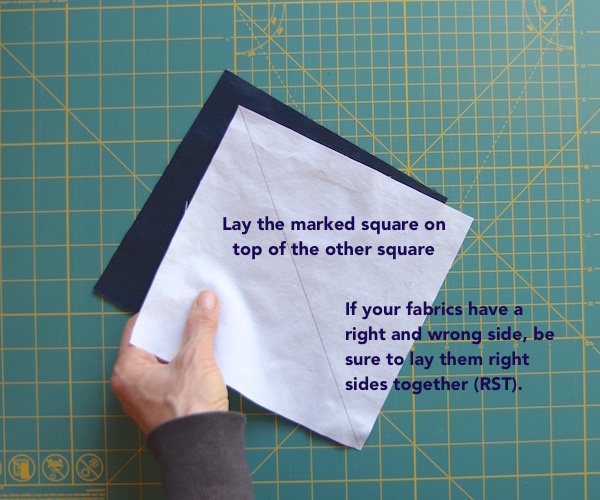 The advantage to this method is that it is super fast – you just place two squares of fabric, right sides together, sew a quarter inch seam around the entire outside edge, cut an “X” corner to corner and you have four HSTs. All you need to do is press them open and trim off the little dog ear corners. 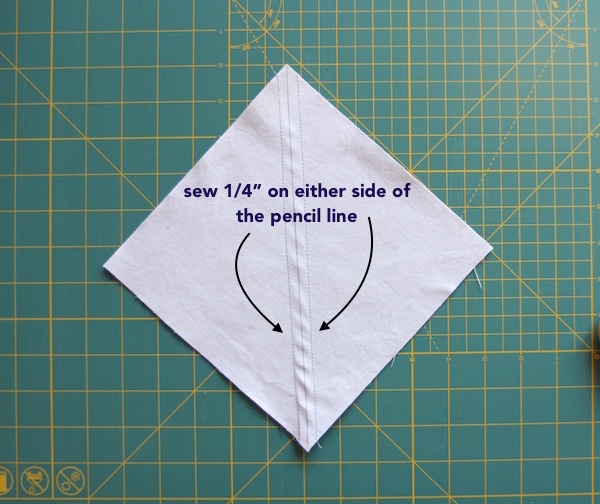 You don’t even need to draw any lines with a pencil on your fabric with this method. 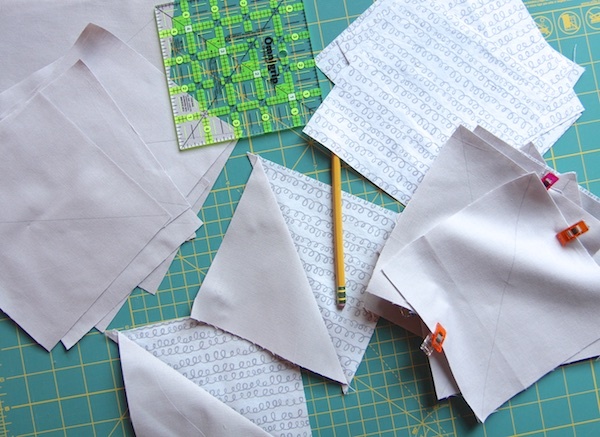 In order to figure out how big to cut the two squares of fabric, the calculation is very easy. Do not be scared of the following math! 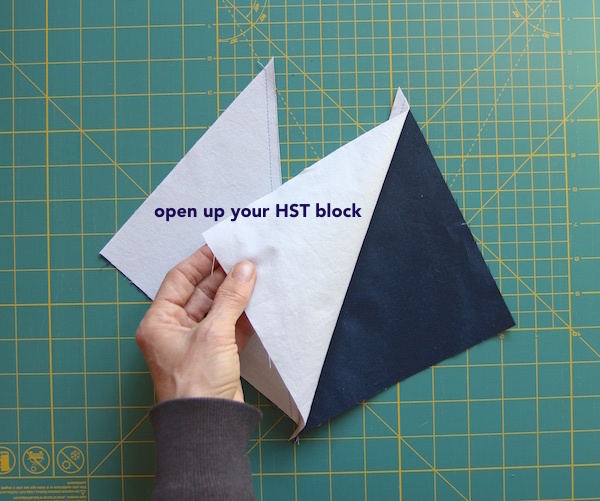 Figure out how big you want your HSTs – and that means the size of your “unfinished” HSTs, before you sew them together into your quilt – and divide by .64, which is easy to do on your calculator. 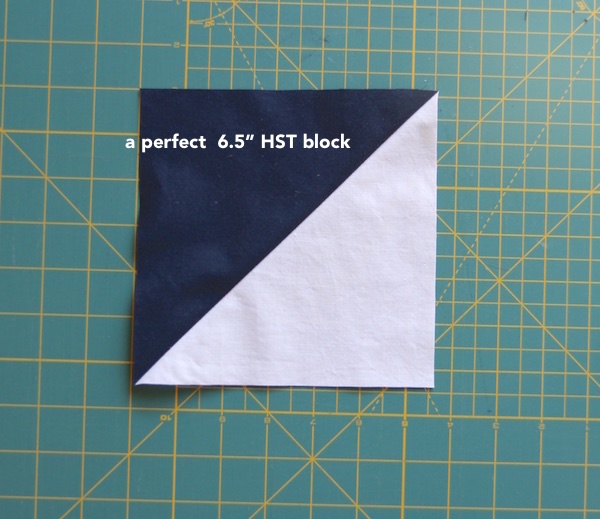 For instance, if I wanted finished 3″ blocks in my quilt, I would need 3.5″ unfinished HSTs. 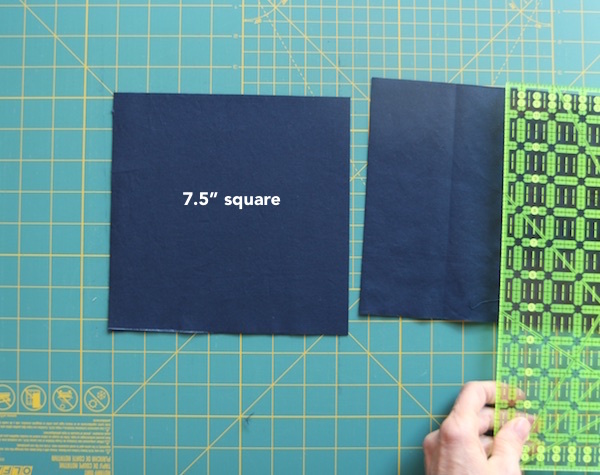 So I just take 3.5 and divide by .64 and I get 5.468, which I will then round up to 5.5″ squares of fabric. When using this calculation, keep in mind that this is not an oversized HST that you will trim. 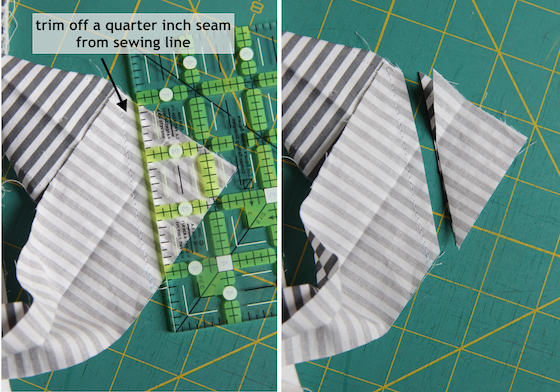 If you like to make your HSTs oversized and then trim them, down, just calculate a little bigger and then you can do that. To trim them down to a perfect HST, this technique is my favorite for trimming. 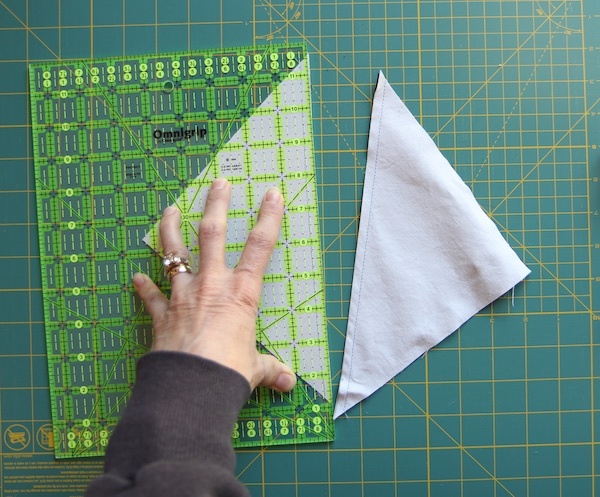 In my next tutorial on the HST, I will show you Method III – how to make eight at a time! I hope this tutorial is helpful! 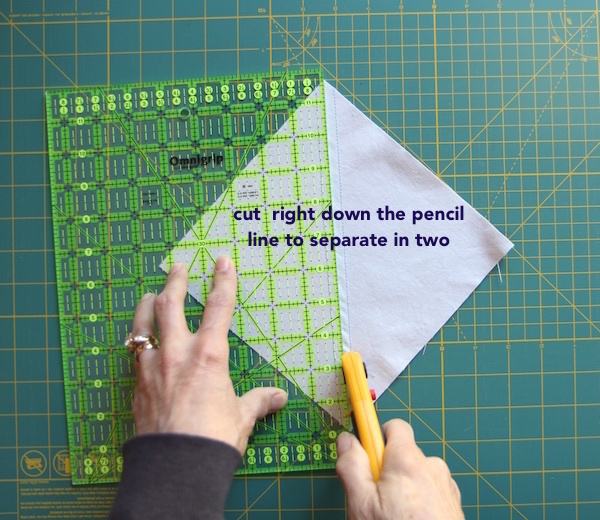 tip: the cutting is easier to do on a small little cutting mat, if you have one, because you can make the first cut, spin the whole mat around and make the second cut. This entry was posted in techniques, tutorial on June 6, 2016 by Beech Tree Lane Handmade. 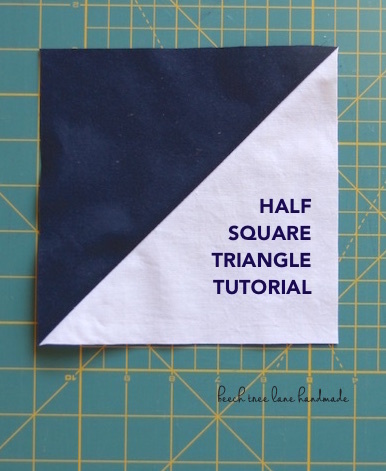 If there’s one block in all of quilting that you should know how to make, it’s the Half Square Triangle (HST). 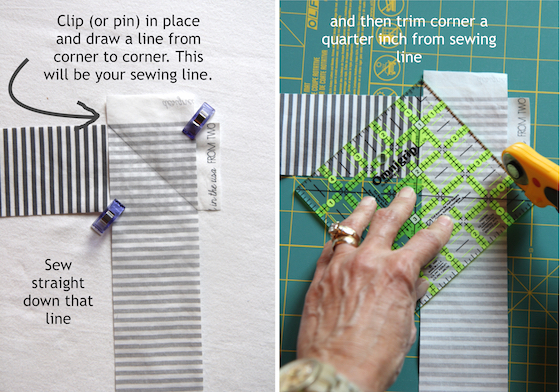 To me, it’s the most versatile block in quilting and you can do endless things with it in design. With this one block, I can make a wide variety of quilts. In this post, I’m going to show you the Traditional Method of making them, two at a time. In my next post, I will show you a way of making them four at a time. This technique is simple and easy to learn and is actually very quick after you get an “assembly line” system going. Two squares of fabric are cut, placed right sides together (RST), sewn from corner to corner and cut apart. You end up with two HST blocks. 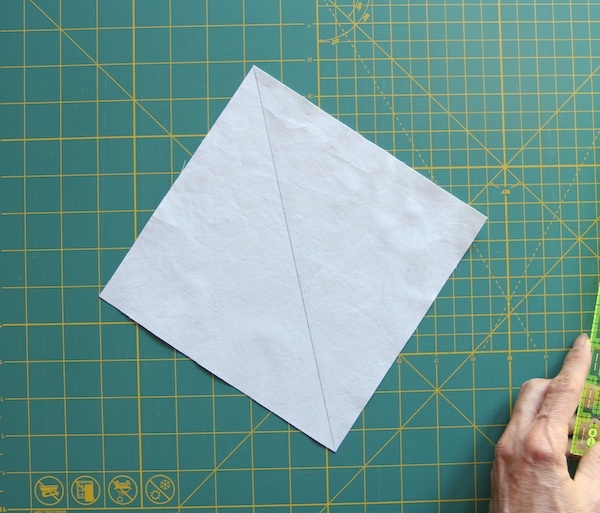 With this method, you don’t need any chart to figure out how big to cut your squares. 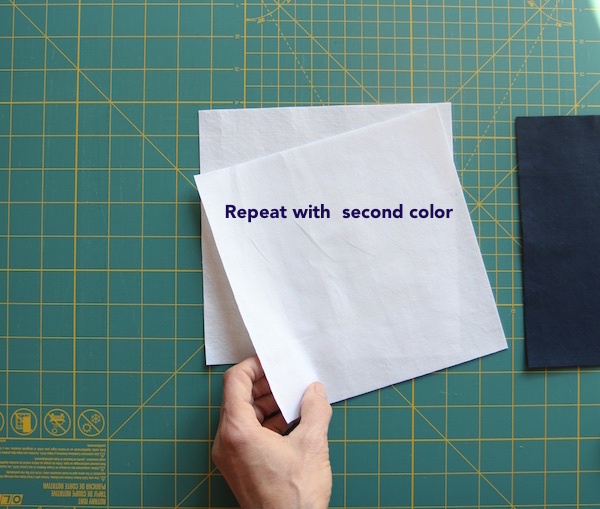 This method makes two HSTs at a time. This entry was posted in techniques, tutorial on November 22, 2015 by Beech Tree Lane Handmade. Having a beautiful mitered binding on a quilt is the perfect finishing touch and the part I love the most. 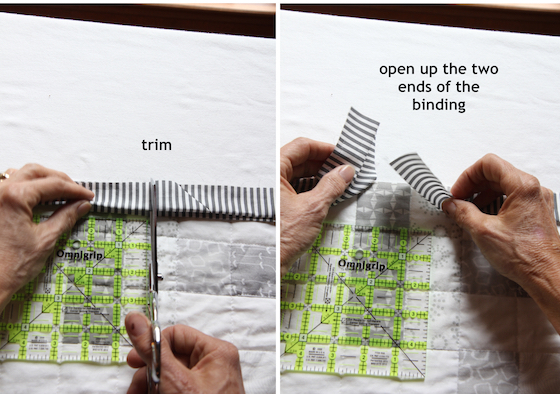 There are different ways to produce a binding like this – I prefer to stitch my binding down on the front, wrap it around to the back and stitch in the ditch on the front, so the stitches are hidden and the sewing line only shows on the back. It is just personal preference and you will have to decide how you like your binding to look. 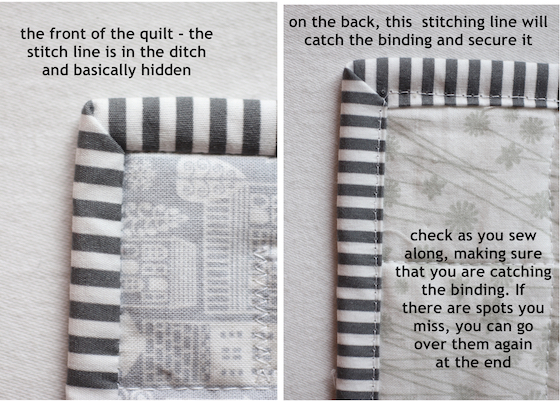 I like to make my own binding, choosing a fabric that complements the quilt and sets it off nicely. 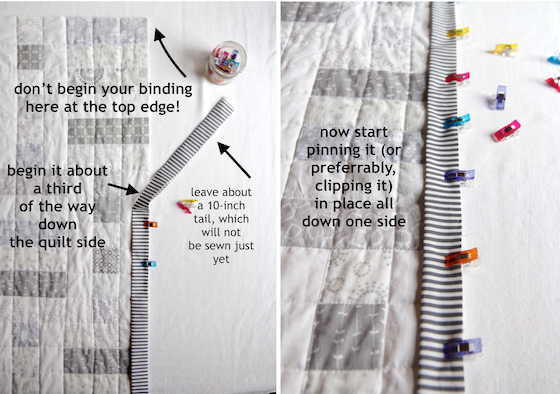 A stripey binding is very popular with quilters and adds a little zing to the edges. Any small repeat is nice, too. 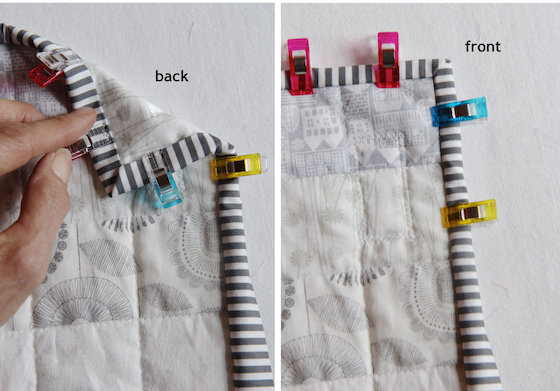 You can also use a solid or even use scraps and make a scrappy binding. 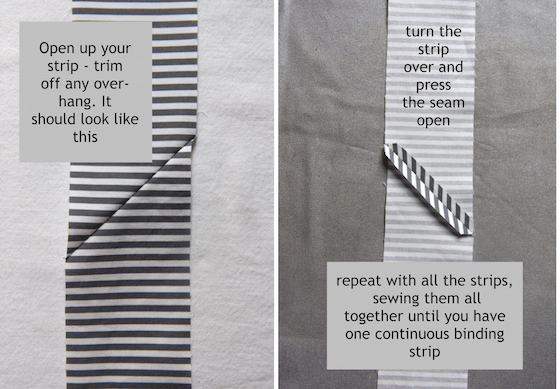 You will be cutting strips cross-grain to make this kind of binding and then sewing them together to make one long continuous strip. 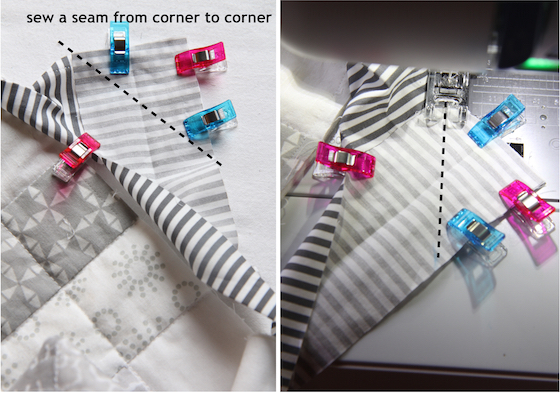 The tutorial shows you how to join the strips together on a diagonal, so the seams lay a little nicer. 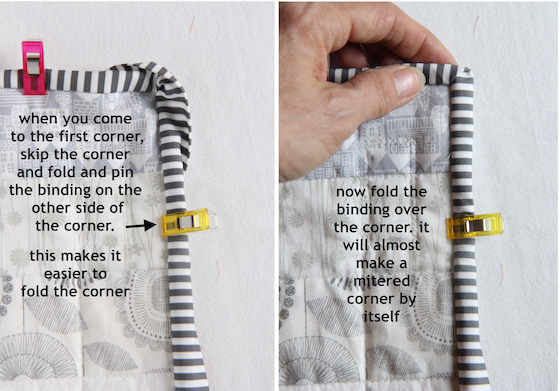 This binding is not difficult to do, but requires slow stitching for precision. I recommend using Wonder Clips from Clover instead of pins. They are faster, easier to use and more precise. They will hold your binding better than pins and will not shift as you clip and unclip them. 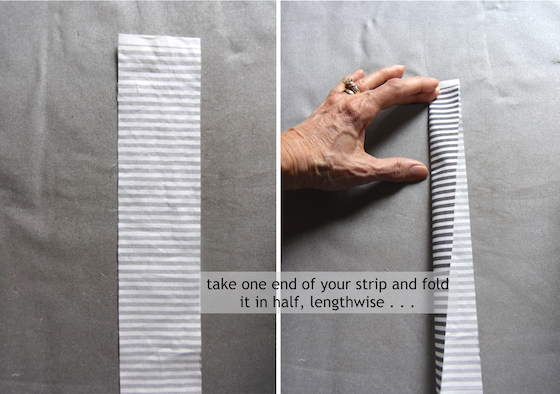 There are several ways to calculate how much yardage/strips you will need to make your binding. Different people use different formulas, some of which are way too generous and I think waste a lot of fabric. I personally love to use this app by Robert Kaufman that is super easy. I downloaded it from the iTunes store and I highly recommend it. If you don’t want to use a phone app, here is a web site that functions very close to the Robert Kaufman app and is very easy to calculate your binding: lily street quilts. 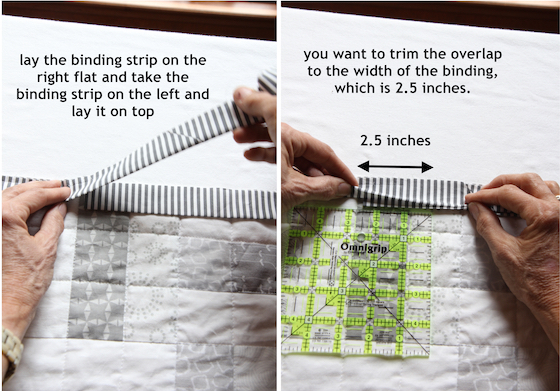 Just plug in the dimensions of your quilt and scroll down to the bottom of the page and plug in your binding width desired. Click “calculate” and it will give you the yardage and # of strips you need. This entry was posted in binding, techniques, tutorial on October 20, 2015 by Beech Tree Lane Handmade.